Welcome to The Productive Life podcast! In this episode, we’re talking about how to create a morning and evening routine and stick to them! Are you tired of snoozing your alarm, feeling scattered all day, and not getting enough sleep? Follow these simple steps to create an effective (and enjoyable!) morning and evening routine AND how to stick to them! I have struggled with waking up early and developing routine for pretty much my entire life. I am a chronic snoozer. I don't even hear the alarm and I snooze it. Even if the alarm is across the room, I will get up in my sleep, turn it off, and get back in bed. Growing up, my mom had to wake me up for dance practice in the mornings by turning on the lights and helping me physically get out of bed. In college, I always slept through my alarm and never made it to my 8:00 AM classes. Eventually I had to just stop signing up for those because I knew myself better. When I started my corporate job in Human Resources, I would make it to work on time or maybe five minutes late, but the mornings were full of chaos. I was always scrambling, running late, and snoozing through alarms. Even as an adult working from home, I have been really reliant on my husband to wake me up in the morning. Needless to say, I’ve never been a morning person. Even on days when I did wake up on time, I never had a structure or a routine to follow. But this isn’t how I wanted my mornings to be. I know that how you start your day, sets the tone for the entire day. So over the past year I have been making an effort to develop an effective morning routine. I’ve found that when you have the right morning routine in place, you start to realize that following your routine isn’t optional anymore. You see the impact immediately on your mood, mindset, and overall enjoyment of your day. Routines help you have a more enjoyable day. There are a lot of things you can do (or not do) in your morning and still get work done. You can still be productive without a routine. But having a routine is what makes the difference between a productive day and a day where I was flowing in the work I was doing, enjoying the day, and left feeling satisfied when I went to bed. We aren’t, however, creating routines that are so strict that they confine you. I believe that the right routines are flexible, adaptable, and always being tweaked. I don't think you have to have one singular routine every single day to be successful. Routines should change and fluctuate based on what's going on in your life. Your routine should be able to accommodate when your life situation changes, your priorities change, or how much sleep you get changes. So maybe you have a life situation that changes, maybe your priorities change or maybe just the way you're feeling. As women, we are cyclical creatures and it is important to acknowledge that. When you begin listening to your body, you may realize that your routines need to change based on where you are in your cycle. Now that I’ve designed a morning and evening routine that is right for me, I’ve been able to see a noticeable difference in my days. I can’t wait to share this process with you! Now let’s start by creating your morning routine! Step #1: List out everything you want to do in the morning. The first thing you need to do is list out everything you want to do in the morning. Do you want to meditate? Do you want to journal? Do you need to do certain things like unloading the dishwasher, refilling dog bowls? Do you need to work out or change and get ready for the day? Do you need to drop kids off? Do you need to make breakfast? List out all those different things that you want to do in the morning and also the things that you have to do in the morning. Step #2: Prioritize your list. Next, go through that list and prioritize everything. 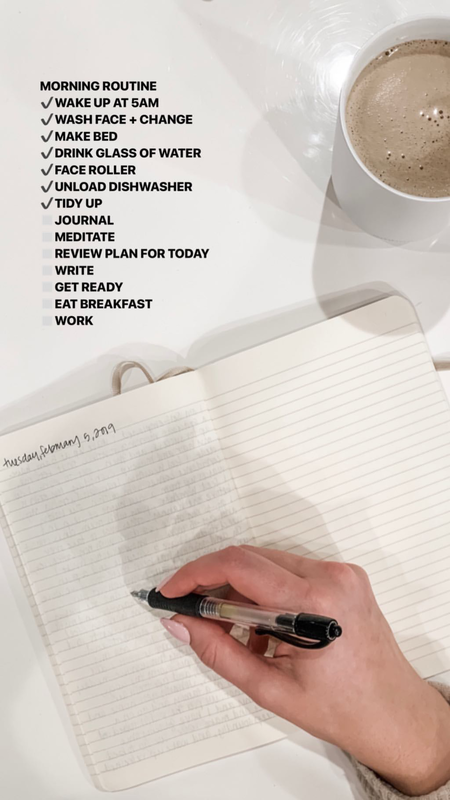 If you listed out 15 different things you want to do in the morning, rank them from 1-15 in importance and put that number next to each item on your list. This is not the order in which you need to do the tasks, so don’t worry about that yet. This is just how important they are to you in the morning and what is a non-negotiable. Step #3: Estimate how long each task will take. Go line by line and assess how long each of the items on your list will take you to complete. Maybe unloading the dishwasher takes 5 minutes but preparing breakfast takes you 30 minutes and getting ready takes you another 30 minutes. If you had meditation on your list, would you like to meditate for 5 minutes or 30 minutes? It is up to you! But go through each item on your list and estimate how long something will take you to do. Step #4: Assess how much time you have in the mornings and compare it to your list. Step four is a bit of a reality check, because we need to look at how much time you actually have in the mornings. What time do you wake up now and what time do you have to stop your morning routine? Your morning routine likely has to end when you need to start work or begin your day. Once you’ve done that, compare how much time you have available to the total amount of time your ideal morning routine will take. If you’re like most people, your ideal morning routine may take longer than the time you currently have available. That’s okay! We’ll work on that in the next step. Right now we just want to be aware of how large the discrepancy is. Did you build out a 3 hour routine but only have 1 hour? Or maybe you built out a 2 hour routine and have 1.5 hours? Whatever the case, we need to just see what the discrepancy is and acknowledge it before we can move on. Step #5: Make adjustments to resolve the discrepancy. In step 5, we need to ask ourselves a few questions so that we can address this discrepancy. Question 1: Can you wake up earlier? Realistically, there's probably a chance that you can wake up 30 minutes earlier than you are right now. Maybe you can wake up even earlier if this list is really important to you. Either way, look at how things are now and decide if you would like to wake up any earlier than you currently do. If so, see how much extra time that gives you. Question 2: What can you do the night before? There are probably things on your list that you can actually do the night before. When I was doing this exercise, I realized that there were a lot of household chores that I was doing in the morning without realizing it. I was trying to load the dishes, take out the trash, tidy up, fluff the pillows, take out the trash, refill the dog bowls, fill up the coffee maker, and more! Those are all examples of things that we can do the night before and that, cumulatively, will give you a lot of time back in your morning! So go through your list and make a note of what tasks you will do in the evening instead of in the morning. I’d recommend highlighting them or creating a new list altogether for your evening routine that we’ll work on more later. Question 3: What should you do at another time during the day, adjust, or remove altogether? The third question to ask yourself it there’s anything left on your list that you can do at another time during the day, adjust the length of, or remove it altogether. Hopefully the priorities you set in Step 2 can you help you determine what you may need to remove from your morning routine or adjust. What can do it at another point in the day (lunch time, afternoon, evening, etc.)? What can you adjust your expectations of? Can you do something for 5 minutes instead of 15 minutes? Or can you do it 3 times a week instead of 5 times a week? Or you can just realize that it isn’t going to happen right now and remove it altogether. In some phases of life, we just can’t fit in everything we want to do so we have to accept that and make accommodations. Step #6: Build out your morning routine. Now that you've answered those questions, you should have a list of things that you have to do in the morning that are high priority and that fit in the time that you have available. So step six is to take all of that and build out your morning routine. Take each item on your list and put it in the order that you want to do them in. Then assign a specific time frame to do each of the tasks. It’s okay if this isn’t perfect, our goal here is to have a starting point to work off of. So just do your best to put them in an order that you think makes sense and that would make your morning feel enjoyable! For example, I have on my morning routine that 5:00-5:15 AM is when I’ll get out of bed and wash my face. Now, it doesn't actually take me 15 minutes to just wash my face, but I know that my alarm going off, getting out of bed, putting on my robe, going into the bathroom, getting out my face stuff, getting the water hot, washing my face, and doing my morning skincare routine will end up taking me about 15 minutes. So don’t just think about that one task but think about everything involved in doing that and assign it a time frame. The goal is for you to end up with a morning routine where each minute is mapped out so that you know exactly what to do, when to do it, and how long you want to spend on it. Why do we have evening routines? An evening routine is going to help expedite and streamline our mornings. As you’ve already seen during the morning routine exercise, there are things we do in the evening so that we can save time in the morning. So when we don’t do our evening routine, it will affect our morning routine. Your evening routine will also help ensure that you go to bed on time so that you can wake up on time. The evening routine is what sets you up for success. When you follow your evening routine, you’ll get plenty of restorative sleep, feel great when you wake up, and be able to use your time strategically in the morning! If you’ve ever felt like your morning routine was stressful or lackluster, chances are it is because you didn’t have a complementary evening routine. Now let's dig into how to create that evening routine. Step #1: Create or review your list of evening tasks from the morning routine exercise. While we created our morning routine, you should have identified several tasks that you can do in the evening. Create a new list from those tasks if you haven’t already and review it. Step #2: Add things to the list that will help you have a more productive morning. In step two, we’re going to add things to the list. What could you do before bed to be more productive the next day? Maybe you could prep some food. Maybe you need to load the dishwasher. Maybe you need to throw your clothes in the washing machine and have a delay start so it starts automatically the next morning. Maybe you need to plan out your to do list for the day. Maybe you need to do some journaling before bed to help you get a better night’s sleep. Anything that comes to mind, add it to the list. Step #3: Add things to the list that you want to do (or need to do) in the evenings. Also ask yourself what else you want to do (or need to do) in the evenings. You probably need to get ready for bed and shut the house down before going to bed, What else do you need to do or want to do before bed? Maybe you want to read for 30 minutes. Maybe you want to spend quality time with your family. Maybe you want to spend some time going through an online course you signed up for. Whatever it is, add it all to your list! Step #4: Estimate how long each task will take. Step number four is to look at your list and decide how long each these things are going to take you. Go line by line and and determine how long each item on your list will take you. Step #5: Figure out what time you need to go to bed. Now we need to work backwards to build out your evening routine. Based on your morning routine and wake up time, decide what time you need to be asleep to get a full night of rest. If you want to wake up at 5:00 AM and need 7.5 hours of sleep, that means you need to be asleep (not in bed, but asleep!) by 9:30 PM to get enough sleep. That is your new bed time! Step #6: Work backwards to create your evening routine. Now that you know your bed time, we need to work backwards from there and build out the rest of your evening routine. For example, if you want to be asleep at 9:30 PM, then from 9:15-9:30 PM you should probably be in bed tryin go to sleep. If you want to read in bed for 30 minutes, then that means you need to be in bed reading from 8:45-9:15 PM. Be sure to actually put your evening routine tasks in the order that you want to do them in. That way when it is time to start your evening routine, you know exactly what to do and when to do it! Once you’ve mapped this out, you’ll also see what time you need to begin your evening routine. My routine, for example, begins at 8:00 PM and goes until 9:30 PM. I know exactly what I need to be doing for that 1.5 hours and what order to do it in. Step #7 (optional): Adjust as needed. If you mapped out your evening routine and are happy with it, then you can skip this step! If, however, you’ve built out an evening routine that requires you to begin at a time that doesn’t work for you or your family, this step is for you. In step seven, you need to make some adjustments to your evening routine. What can do it at another point in the day (lunch time, afternoon, etc.)? Make those adjustments to your evening routine until you have an evening routine that fits you and your lifestyle. Now you have your morning and evening routines, yay! But how do we stick to then? Here are my best tips for sticking to your routines! Tip #1: Print out your routine, observe how you spend your time, and continuously tweak your routines. The first thing you need to do is print out a physical copy of your morning and evening routines for the week. This will not only serve as a physical reminder of your routine, but it will be crucial in us observing how we actually spend our time. I actually have a free Morning and Evening Routine template for you that you can download right now so you don’t have to create your own! This is a Google Doc that you can download, edit, and start using immediately. Whether you’re using my template or your own, keep following this process! Throughout your morning and evening routines, I want you to make notes on your printed out routine. Mark things off as you do them, make note of how long each thing takes you, and make notes of what things you swap or skip altogether. The first time you create your routine it won’t be perfect. That’s okay! Instead of trying to stress yourself, just do your best, and listen to your body. Really lean into what feels right in the morning. Maybe you really need that cup of coffee before you unload the dishwasher. Totally fine! Make that swap. Make a little note on that day and see if you do that one or two days in a row. And once you realize that that is truly a preference, make that adjustment in your digital version. Flip those around! That is the point of this entire exercise. Also be aware of what you skip. Maybe you just don't really want to do it in the morning or you don't have to even do it later or you have to, and maybe it's where it falls in your workflow and your morning or evening that makes it hard to do. Most of us are pretty terrible at guessing how long something is going to take us to do, so it is only from intentional observation that we can start to learn. During the first week of your new routines, expect to make changes regularly. I find that it usually takes one week to really refine your routines and get yourself into a consistent workflow where you can use the same routine for several weeks or months in a row. But continue to be really flexible with yourself. I'm constantly updating my routines! If I noticed for a week that I’m skipping my routine or not enjoying it, then that is a trigger for me to update and change my routine. Some things on there may no longer be serving me or I may just need to refresh the order in which I go about things so that it feels exciting again. Enter a state of mind where you are constantly adjusting and tweaking your routine. They don’t have to stay the same every day forever in order to be successful and happy. But all of this depends on having the printed out routines so that you can observe these patterns in your own life! Tip #2: Set alarms or reminders on your phone to keep you on track. My second tip is to set reminders and alarms on your phone at key intervals so you that you know you're on track in the morning and the evening. Personally, I set alarms on my phone instead of reminders because I’ve found reminders a little too easy to ignore. For example, I will somehow take 45 minutes to wash my face in the morning if I’m not carefully observing my time. I think I just move really slowly and dilly dally! But since I have an alarm on my phone go off at 5:15 AM (when I should be done washing my face), I am reminded to keep moving forward and not slow down too much. Identify what intervals are crucial in staying on track in your routines and make sure to set alarms or reminders on your phone for those. That way you can more easily stay on track and identify when you’re moving a little slower than normal. I recommend that everyone set an alarm for when they are supposed to begin their evening routine. It is so easy to get stuck in television or social media at night and by setting an alarm, you’ll never forget to start your routine on time! Tip #3: Put your lights on a timer. My third tip is to put the lights in your house on an automatic timer. Similarly to the reminders or alarms on your phone, putting certain lights in your house on automatic timers will serve as a reminder to stay on track. I purchased some smart plugs from Amazon but you can use an old school timer or smart light bulbs if you prefer. Having an environmental change like a light turning on or off is an undeniable cue that it is time to do something. And what’s funny is that your roommates and/or family members will notice this too and maybe even start to adapt a similar habit as you! One light in my bedroom turns off at a certain time when I should be asleep and turns on 1 minute before I’m supposed to be awake. One light in our living room goes off when I’m supposed to be heading upstairs for my evening routine. This has been a huge game changer for me and I highly recommend that you do the same! Tip #4: Adapt your routine to fit your needs. My last tip is to adjust your routine day to day. We aren’t striving for perfection with our routines. Because if you try to stick to your routine perfectly every single day, you’ll eventually burn out on it, stop enjoying it, and end up losing out on the magic of an effective routine. Plus, its just not realistic! Based on what is happening in your life and your body, there are certain days where you just honestly need more sleep. Or maybe times where you can sacrifice sleep and stay up late. Our lives are ever changing and that is okay. We just have to accept that and build it into our expectations and approach to routines. Listen to your body and adjust your routine as needed based on that day. For example, if I stay up past my bed time one time, I can probably still wake up on time the next day and be fine. But I can’t repeat that multiple days in a row without suffering some consequences when it comes to my health or happiness. So on days where I know I need to get more sleep, I’ll do an abbreviated version of my morning routine so that I can get some extra sleep. For example, I know that if I don’t unload the dishwasher in the morning, everything will still be okay. So I can cut that out of my abbreviated routine. But journaling and meditation are essentials for me no matter what, so I make sure to do them even on days when I have limited time. I’ll just do them for about 5 minutes each instead of 10-15 minutes each. Accept that life is ever changing and that on certain days you may need to tweak your routines to support you, your body, and your life! Instead, make adjustments for that day and aim to execute your full routine the next day. This has been the biggest change for me in how I used to approach my routines. It doesn’t have to be all or nothing to be effective! Now you know how to create a morning and evening routine and stick to them!